Galway Tribesmen celebrate winning the All Ireland Rugby League Championship crown. 2016 marks a remarkable year for the Galway Tribesmen Rugby League Club which in the space of a week has been crowned ROI champion and now All Ireland champion. On Saturday there is another first for the Galway club when they host the State Of Origin, a contest between the best players in the Republic v the best players in the North. This is the first time the home leg has been held outside Leinster and the club are proud to be hosting the event. The game, which also has an U19 curtain raiser, takes place at Galwegian’s Crowley Park (3pm ). It will be a special day for the Galway Tribesmen who made history for the second week running when they were crowned All Ireland Champions last weekend. 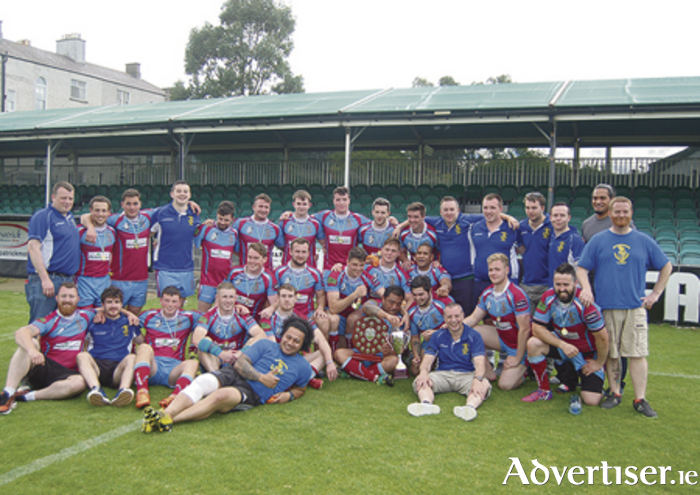 In a nail-biting final at the Carlisle Sports grounds in Bray on Saturday, the Tribesmen prevailed against the champions of Northern Ireland, The Ballynahinch Rabbitohs. Although the northerners lost player/coach Kenny Calladine with a shoulder injury after his first tackle, they drew first blood when Karl Yellop burst through after four minutes to score. Galway looked to have opened their scoring after the restart, but Paddy Finn's try was disallowed for a double movement. However as Galway settled into attack, led by captain Andrew ‘Mika’ Atonio, they dominated possession and were eventually rewarded when Josh Nugent collected Peter O'Neill's cross chip to score in the corner. O'Neill added the conversion to take the lead, but the Rabbitohs capitalised on a loose pass with Chris Orr touching down. The Tribesmen replied through McMahon who burst through from 30 metres with O'Neill's converting, and before half time a superb run and interplay between Conor Mackey and Ethon Maloney, finished with Mackey touching down, and O’Neil's l conversion gave the Tribesmen an 18-8 lead. The Rabbitohs closed the gap after the restart through Yellop, and when the Galway men were penalised, they made it count with Orr grabbing his hat-trick and Ben Parkinson added the two point conversion to take the lead. It did not look good for the Tribesmen when the Rabbitohs added another converted try through Yellop for a 10-point lead, but the Galway men reverted to their free flowing game, worked their way up the pitch, won a penalty, and scored a wonderful try after a superb offload by Atonio created the space for Cathal Evans to score out wide. O’Neill added the extras to reduce the gap to four points. A professional foul resulted in Chris Gibson being sin binned, giving the Tribesmen a one man advantage for the next 10 minutes. and they made it count. Atonio powered over from close range, and O'Neill's conversion put them two points in front. McMahon bamboozled the defence to sprint away and score under the posts, O’Neill converted again, and there were now two scores between the teams with eight minutes remaining. After McMahon was penalised for a double movement, the Rabbitohs got a break from a loose pass with Paddy James touching down and Parkinson converting. However it left the Rabbitohs with a two point deficit just as the hooter sounded, ensuring the Tribesmen were crowned champions.